On our latest movie we tried a 3:1 letterbox. The sales rep said "no way". Now on most of our movies we've delivered a 2.35:1 letterbox and we ain't heard nuthin'. And we usually think of there being a letterbox on set when we're shooting. So if a boom creeps briefly in or what-have-you we don't mind so much. But our rep would prefer full-frame 16x9. Ugh. The letterbox is applied to each clip individually on the whole movie. That's a lot of clicking. So searching around the Internet I found there's a thing called Edit Mule Filter Remover. It's got a 14-day trial and it's only $15 anyway. Perfect. Except the company doesn't seem to exist anymore. Well, I better get all the work done in those 14 days. Except. It doesn't work. 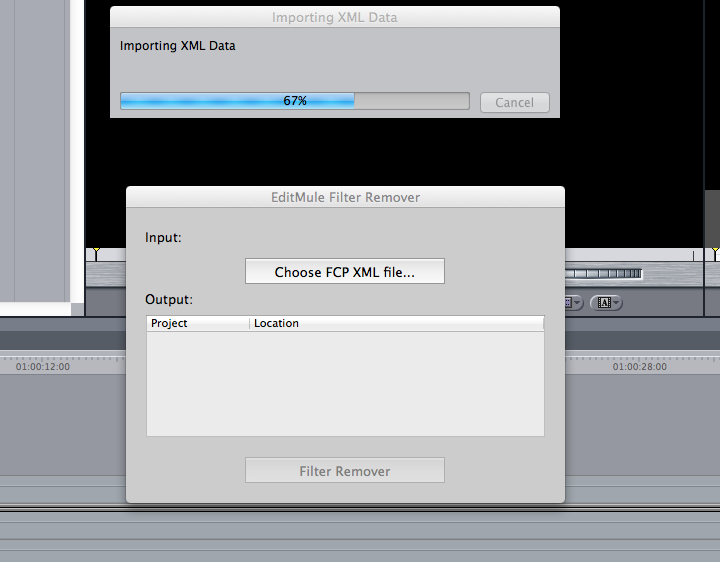 It freezes on importing back into Final Cut Pro. I got no idea. I got nuthin'. I will be doing a lot of clicking today. Oh, and I still reserve the right to letterbox to 2.35:1 because of boom lines and shadows. Luckily it seems that we actually rendered out all the effects at full 16x9.